Did your heart seize up in your chest a little when I said that? It should. Those horrors you've dreamed of all your life - the arms dragging you down into the ooze, the thing with fangs and too many legs waiting in the dark, the sleek, silent killer dropping on you from a clear sky - they're real. But don't fret, little brother. You'll never have to wake up in fear, ever again. The nightmares are real...and you're one of them. Part of the Beast: the Primordial rules, Conditions add an additional layer of consequence and reward to certain actions in the Chronicles of Darkness. Various things within the course of a game can cause Conditions. These include exceptional successes, supernatural abilities, and really any situation where the Storyteller thinks they can be used to heighten the drama of a game. 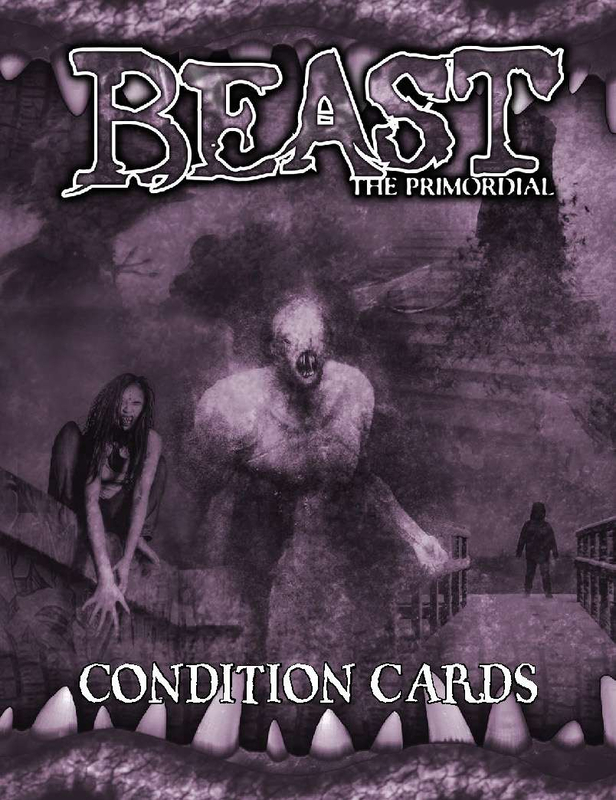 These Beast: the Primordial Condition Cards are a handy way to keep track of and incorporate Conditions into your Chronicle with each of the 36 cards featuring a single Condition. The Primordial Feast: An Anthology for Beast: the Primordial contains nine new stories inspired by the Beast: The Primordial RPG.